Had to paint the pink and yellow ones though. These are from 4 or 5 packages. 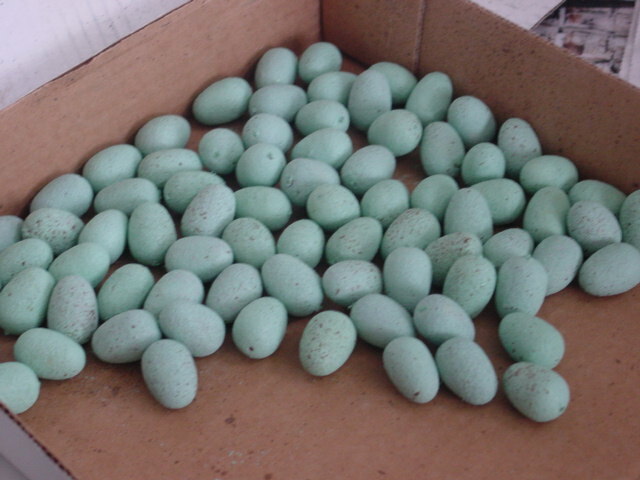 When I find them I buy as many as I can because it’s so hard to find eggs the rest of the year! 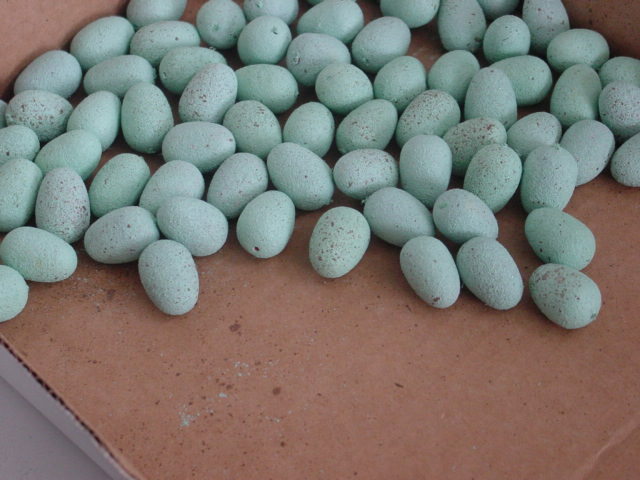 And while painting eggs isn’t the easiest task because of their shape and size (these are about ‘quail’ size) I’d rather buy ones that i have to paint than not have any at all. 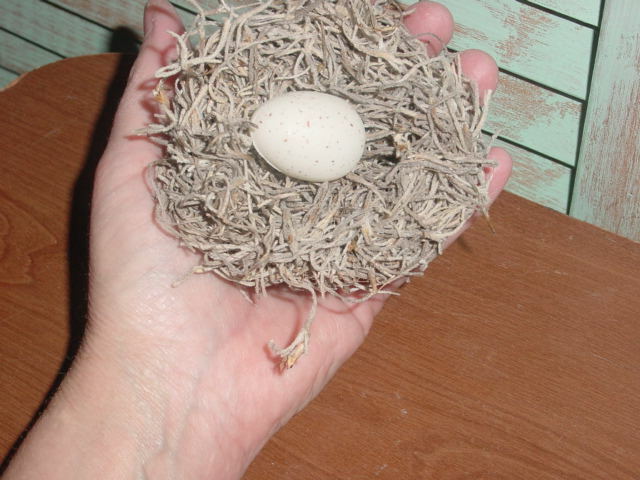 I’ve got a bazillion ‘nest’ ideas left over from last year that I couldn’t complete due to running out of eggs. Trying to hold these between your fingers and paint them is utterly futile. Here’s how I do it. I take a small plastic tray (saved from those pre-cooked entrees) and cover as much of the bottom of it as I can with a sponge. (I bought the ginormous bag of assorted sponges at dollar store years ago and always find a new use for them!) This one was much flatter than the res of the sponges and perfect for my use here. Thicker ones will work fine too, and even 2 or 3 of them side by side will work just fine. 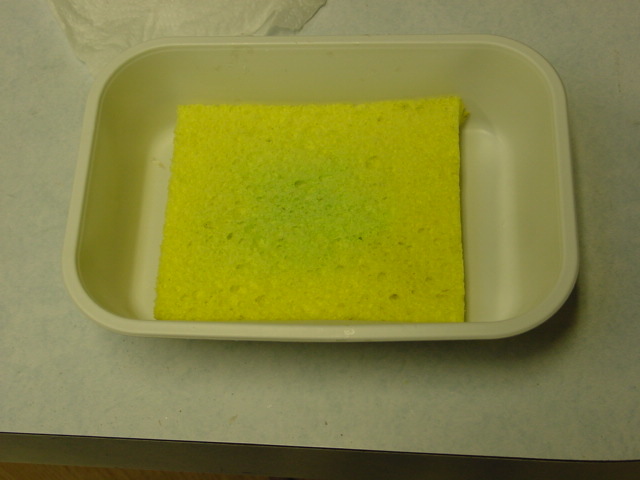 Dampen your sponge to soften it up, then wring, WRING, WRING out as much water as you possibly can. You want it to be soft and damp, not wet and soggy. 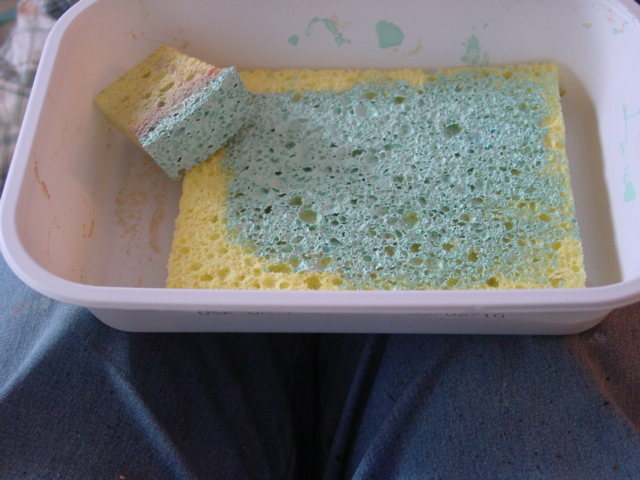 Next take a small piece of cut sponge (sponge painting tool!) and dampen JUST 1/4″ of the end, and wring out as much moisture as you can. You want just the painting end to be soft, the rest needs to be firm enough for you to handle. Squirt some paint onto your base sponge and work it around with your tool piece. Kind of like loading a paint roller. You want it well loaded, but not sloppy sloshy full. 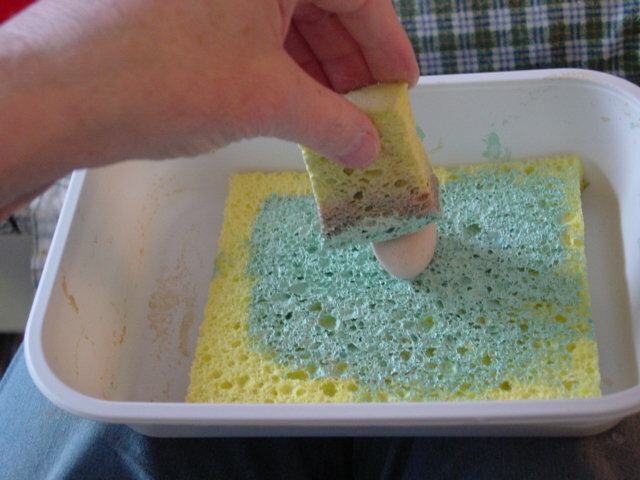 Plop in an egg, and using your tool sponge, press and roll it around in the paint using your sponge tool. You’ll be applying paint top (from the handheld sponge) and bottom (from the surface sponge). 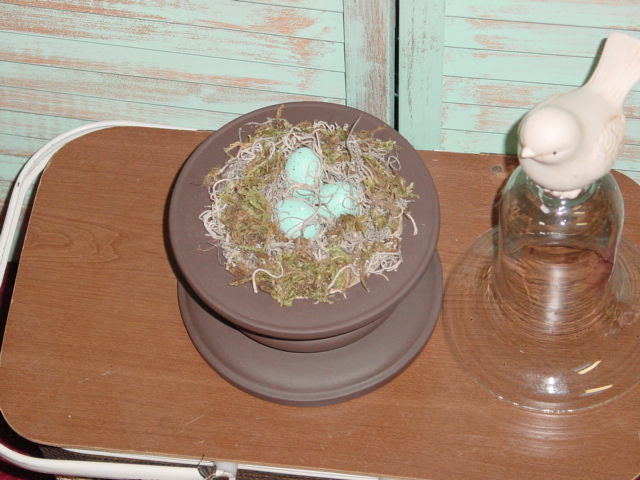 Do this until your egg is fully covered with paint. Then drop it onto a drying tray. You’ll need to repeat this process twice to get complete coverage. I do ALL my eggs with a first coat, let dry, they do all with a second coat. For the second coat, you can do several eggs at a time. 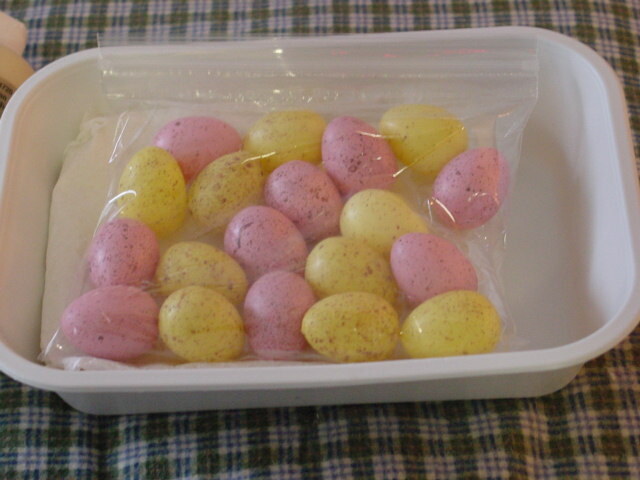 For adding specks to the eggs, I use a ‘fly specking tool’. Seriously, that is what it’s called. You can buy them at the craft store. Just thin your paint about 50/50 with water. 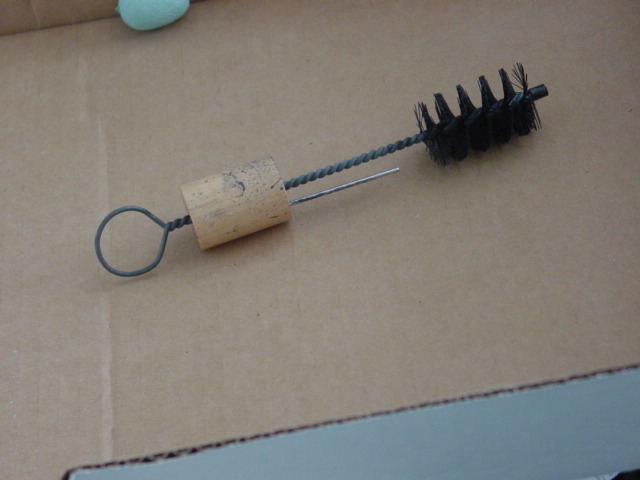 I’ve seen lots of crafters who use old toothbrushes or combs for this, but I could never get them to come out right, so I splurged and bought the tool; under $5.00. I cram my eggs close together for the specking process, so thins just gets one side. Let dry. shake your eggs around to expose the other side and speck again. You’ll need to do this 3-4 times, depending on how speckled you want your eggs to be. And now I have enough eggs to last me ALL spring!